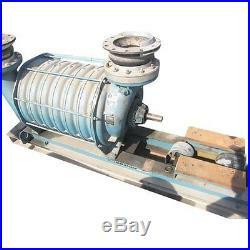 ITEM #: 12037 Used Hoffman Centrifugal Multistage Blower - Model 65107a1 (parts) No motor. Inlet connection: 12Ø ANSI 150. Outlet connection: 10Ø ANSI 150. SPECIAL OFFER: Choose to pay with check or wire transfer and be eligible for a 3% discount on your entire order. Please be aware that we do accept Personal checks. Skidding/Crating available at additional cost. Items are also listed on other venues and are subject to prior sale. The item "Used Hoffman Centrifugal Multistage Blower Model 65107a1 (parts)" is in sale since Friday, November 20, 2015. This item is in the category "Business & Industrial\Manufacturing & Metalworking\Process Equipment\Other Process Equipment". The seller is "jmiwv" and is located in Millwood, WV.